An eight-month $100-million project on Interstate 70 east of Idaho Springs commences today, kicking off a long-term closure on the eastbound highway lanes and frequent traffic stops in both directions. Crews will work at what transportation officials have described as break-neck pace to widen a four-mile segment of the interstate to three lanes before the start of the next ski season. The project – intended to relieve a choke point where skier traffic backs up on the return trip to Denver on peak travel days – will completely close the eastbound lanes of I-70. A 35 mph detour will allow eastbound drivers to travel around the closure at the Twin Tunnels using a nearby frontage road that has been improved to support interstate traffic. Officials say on light travel days the detour should increase the trip from Summit County to Denver by only a few minutes. During heavy congestion, traffic is often traveling through the detour area at speeds than slower 35 mph anyway, and is therefore not expected to greatly impact peak travel times either. 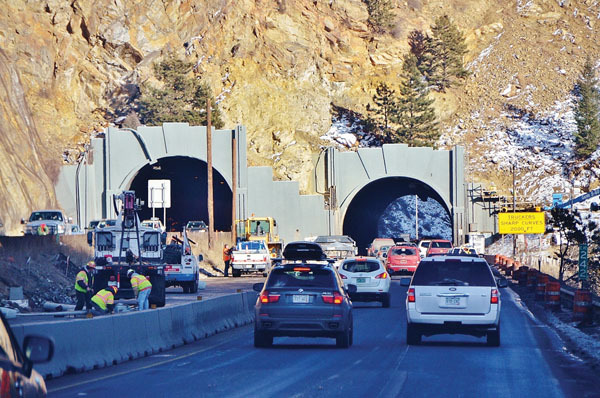 The project will require crews to blast open the eastbound Twin Tunnel bore to accommodate the third lane, which will be continued through to the base of Floyd Hill where it will join up with an existing third lane that continues all the way into Denver. “We’re chasing that three-lane section back four miles,” Colorado Department of Transportation engineer Jim Bemelen said. Blasting operations inside the eastbound tunnel will require full traffic stops on both the eastbound detour and the westbound highway lanes. Crews will need to halt eastbound traffic for up to 20 minutes. Westbound traffic will generally be stopped for up to 30 minutes during blasting operations as crews will need extra time to conduct a safety check before allowing cars to proceed into the tunnel facilities after a blast. But transportation officials have promised to take all possible measures to limit the impacts of the work. “We recognize that it’s one of the first (projects) out there on I-70 and it has to go well,” said Amy Ford, project communication manager. There will not be blasting operations on Sundays, generally the busiest travel day of the week on the mountain corridor during the summer months. There will always be two lanes open in both direction on peak travel days, transportation officials say and local radio stations and electronic messaging signs along the corridor will help keep drivers informed about the scope and purpose of the work. The CDOT website (www.coloradodot.info), social media and a new smartphone application will also provide regular updates on blasting schedules and project impacts. The widening is set to be completed by early November.